Oh, the humidity. It’s back. And it brought with it a whole mess of doubts. Some of my training (track workouts, ten milers, tempo runs) has gone well, better than ever. But the workouts most specific to the marathon—from which I get 99% of my confidence—have been abysmal. The first marathon pace workout was a disaster, but I told myself it was the first one, and I just needed to re-callus myself to the hurt of those workouts. But then the second was the Exact. Same. Pace. What?! No. I’m in better shape than that. It was a little warm (emphasis on a little) and a little humid (again, emphasis on little), but I was melting. I had to reroute to find a water fountain so I could dunk my head in it. I vowed to go earlier next time. But it didn’t work, and the workout was abysmal. Try as I might, I can never fully capture just how sweaty I am. These pictures don't do it justice. Of course, part of me wonders whether it’s the weather. Maybe there’s something about my training (physiologically or psychologically) that is off. Maybe I’m just making excuses. Maybe I’m a wuss who can no longer handle the hardest workouts. Maybe the long-sleeve wearers are just tougher than me. It’s easier to blame the weather than to barrel down this doubt spiral, but even cursing the weather incessantly (for an entire blog post!) doesn’t push these doubts away. I’m telling myself running in warmer weather will make me a better runner, whether race day is warm or cool. (Please, God, let it be cool!) But the damage to my confidence seems irreparable. How can I tell myself I’ll hit paces on race day that I can’t hit in practice? This weekend I’m running the Wildwood Half, my last race before the marathon. Part of me thinks my early season goal for this half is completely crazy, as proven by my marathon pace disasters. But another part of me hopes I can live up to those expectations, silence the doubts, and get back to believing my marathon goal is possible. Here’s hoping the weather’s nice. *Some people wear long-sleeve shirts to block the sun, which is completely reasonable. In super sunny conditions (like Badwater), long sleeves are the best bet. But it was cloudy on the day in question, so that wasn’t their reasoning. It just really wasn’t hot to anyone but me. It has been so hot and humid! I always struggle with wearing sunscreen because it just traps in all the heat and sweat. I actually have an SPF long sleeve shirt that I used to like wearing instead of sunscreen. I may have to dig that out. Good luck in your half marathon! Thanks, Liz! Oh man, sunscreen is the worst. I keep trying different brands hoping one will magically not feel like an extra layer. I think Neutrogena Wet Skin Spray is the best, but still wish there was a better way to both avoid the sun and wear as little clothing as possible. Finally. Someone just like me! Lol I thought I was the only one who doesn't handle even mildly warmer temps for running. I laughed while reading because I've totally questioned if I was a wuss too lol which marathon are you running? Way cool you're aiming for Olympic trials! I'll follow along your journey dnd cheer you on girl! I am always cold, but I'd rather be cold than hot - I do NOT like heat and humidity (so much fun living in Houston and now DC....) I'd always rather run in cold than hot. 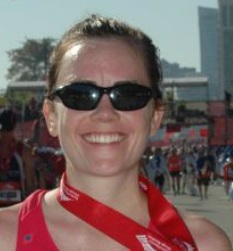 I'm the person who - except for rain - thought this year's Boston (my first) was pretty darned decent. (and I almost went hypothermic in the Village!) I'd take this year's weather over the warm year. I didn't get too much wind. Shamrock 2014 temps were great (Fort Story headwind not so) and so were Baystate and Richmond - chilly and preferably overcast. Low 40s are good. Can you try a quick pace tmill run in an air-conditioned gym to boost your confidence? Thanks for the good luck wishes! The marathon is Grandma's in June. Good luck with your tune-up race and the Grandma's Marathon- and of course, adjusting to the heat and humidity. To me, the month of May is the worst because you're adjusting, once it's summer and hot all the time it's not so bad, but right now we're just not used to it. I'm slow, but my times are also going in the wrong direction and it's frustrating. Sometimes it's crazy to see what people wear for workouts. I've gone for runs wearing a short sleeved shirt and shorts (my usual attire) to see people dressed in North Face fleece and tights. I live in Charleston SC, so I guess people just want to get a few wears out of their winter clothes since it doesn't get cold here? Hey Teal! Congrats on your win! (Though I am sure that was not the pace you were aiming for because I know you are faster than that :)) But a win is still a win - congrats. Looking forward to reading your recap on that! Also wanted to chime in on the heat/humidity. Which I hate. I know they say that it simulates training at altitude but I already want to cry uncle and it's only May!!! I did see research (http://running.competitor.com/2014/06/nutrition/stay-cool-on-summer-runs-with-a-slushie_42014) that says that drinking a slushy before the start of a race/workout can help keep your core temp cooler and I'm going to have to test that out soon. But for now, it's sweat city.